The risk of investing in the overal stock market is measured by the market “volatility.” That volatility is measured the annualized standard deviation of daily stock market returns. During the years from 1962 to 2016 the average standard deviation has been approximately 15.50%. Of course, it was much higher during crises and lower during quiet time, but on overall average 15.50%. To compute historical standard deviation requires data past data on returns, but there is another way to get an estimate of how volatile the market returns are expected to be on a forward looking basis. That can be done by solving for the volatility that equates the market prices of options on the S&P 500 index to theoretical prices derived from option pricing models. The Chicago Board Option Exchange computes the number on a daily basis for S&P 500 puts and calls with a maturity of 30 days. That number is referred to as the VIX index. Like the S&P 500 index, options and futures are traded on the VIX index. The reason for all this background is that despite what seems like a turbulent situation in Washington and around the world, the VIX index is currently trading at all time low of about 10.80%. What’s more it has pretty much been stuck as this level for about the last six months. Now you may think that such a low level is not sustainable and the volatility should tend to rise back toward its historical average. If that is your conclusion, you are not alone. 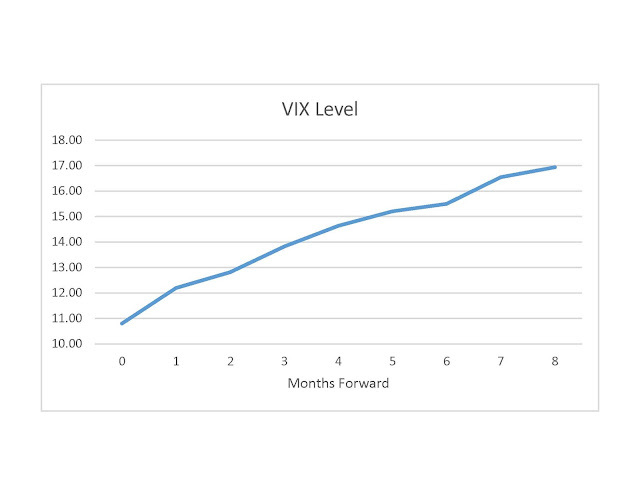 The figure below shows the futures curve for the VIX. To a high degree of approximation, futures prices can be interpreted as the market’s expectation of the future level of the index. The figure shows the expected volatility rising steadily to 16.94%, a level higher than the historical average, by next February. Note this means that you can’t make money betting on the increase because the market prices have already impounded the expect rise. Ironically, the market has been expecting such an increase for the last six months while the VIX has remained locked at record lows. As a result, the people who made money during that time were those who bet against the anticipated increase. My advice for now is to watch the VIX index closely. In future posts, I will explore some of the investment implications of its record setting behavior. Next PostIs the Fed Responsible for the Chaos at Uber?